What is Feng Shui you ask? That's just what we asked when our friend Ray Beckstrom became a Feng Shui consultant and started rearranging our furniture - which lead to a lot of shouting, eye-rolling, and eventually... Our Fifth Book! Back in 1994 when we wrote "The Duct Tape Book" we didn't put "Book One" on it because we figured, "Well, that will be that." But NO! We started getting letters from people all over North America (and Guam, yes, we actually got one letter from Quam) people telling us of their uses and love for duct tape. So we kept writing books and Page-A-Day Calendars. And, they kept selling. To date we have sold over one million copies of our duct tape books! This month we are releasing our fifth book about Duct Tape, "Duct Shui". Actually this book is a hybrid duct tape book that combines duct tape hints with the one and only parody of the extremely trendy ancient Chinese philosophy of Feng Shui. And, true to Duct Tape Guy form, the book is "breathtakingly stupid" and "downright hilarious." Who will like this book? Anyone who likes duct tape and/or humor. Anyone who's into Feng Shui, Anyone who has never heard of Feng Shui but would like to know what all the fuss is about. Anyone who can't stand Feng Shui... And anyone who wants some good, clean fun. You can get your autographed copy today from the Duct Tape Pro Shop (with a complimentary Duct Tape Pro Bumper Sticker), or from your local bookstore. A woman has the last word in any argument. Anything a man says after that constitutes the beginning of a new argument. 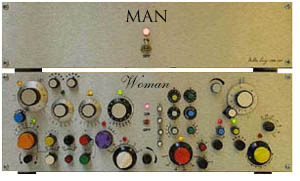 I have no idea who originated the control panel on the left, but we think it pretty much speaks for itself and to the truth of the Man/Woman thing. A woman worries about the future until she gets a husband. A man never worries about the future until he gets a wife. A successful man is one who makes more money than his wife can spend. A successful woman is one who can find such a man. QUOTE O the ISSUE: "Old aunts used to come up to me at weddings, poking me in the ribs and cackling, telling me, "You're next." They stopped after I started doing the same thing to them at funerals. " Shopping Warning: MOTHERS DAY: MAY 12th, FATHERS DAY: JUNE 16th. Here is your chance to save bigtime on all SIX of our Books and our video! We are very space constrained at out office and last year we had to give up our Dilbert-like cubicles and move into even smaller cubicles. That was bad enough, but the smaller cubicles also come with lower walls, only 3 feet high instead of the 4 feet of wall height than the larger cubicles had. As a result we no longer even had an *illusion* of privacy. Well, enter duct tape to the rescue! I went to my local Home Depot and bought a bunch of styrofoam "boards" and with my duct tape taped these boards on top of the existing cubicle walls, adding an extra foot of height and giving back some privacy. As a bonus you can even use push pins on the styrofoam to tape up important papers. And with the duct tape holding it in place the walls are almost as sturdy as the original walls of our larger cubicles were. My move was so popular that most of the people in department followed suit and borrowed my duct tape to add stytofoam walls of their own. 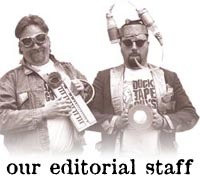 Put your memory and duct tape sleuthing to work at our Duct Tape at the Movies page. Or, just be amazed at how many movies feature duct tape! 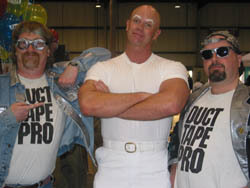 (Go to the Duct Tape Guys' Scrapbook to see us schmoozing with other celebrities (This is Mr. Clean - duh). Our photo caption contest photo is waiting for your creative caption. Click here to try your luck and skill at writing a caption for this month's photo (deadline is April 16th). RANDOM WINNER: The random winner of a duct tape book in this issue is/was: Zachary Marimon. Congratulations! Send us your mailing address and we will send you an autographed Duct Tape Book.